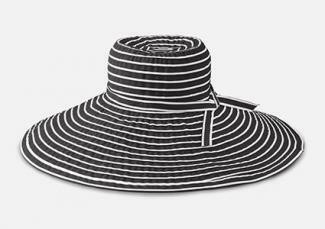 A fabulous sun hat can be the perfect finishing piece to your summer ensemble. This sassy little accessory perched on top of your head can do more than just make you look fashionable. During the summer season, temperatures in many regions can be downright dangerous, so you have to be smart about protecting yourself whenever you plan to be outdoors. In addition to wearing sunscreen, you can protect yourself from the harsh rays of the sun and stay a little cooler simply by wearing a hat. 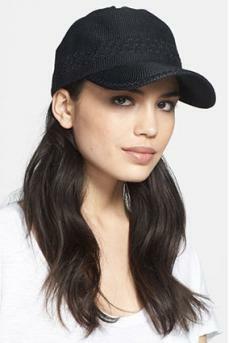 Kangol Sheer Diva: This straw hat is cute and stylish. It features a padded interior sweatband as well as a pinched crown and wide brim with three contrasting stripes. This style is available in beige and rosemary and comes in sizes small, medium and large. It is priced under $60. San Diego Hat Company Ribbon Braid Brim Hat (pictured): This hat is done in a stunning and dramatic style that is sure to turn heads. It is unique in that it is constructed from a crushable material that can be pulled out of your bag and worn without looking crushed. It features white and black stripes and an adjustable sizing tie. The brim measures seven inches, providing the ultimate in sun protection. This hat comes in one size only and is priced around $40. Crochet Baseball Cap (pictured): This cute cap is ideal to wear during the hotter months of summer. The crochet design keeps your head cool while keeping you looking feminine. This cap is available in one size only and comes in colors such as white, tan, blue and pink. It is priced around $20. Nike Women's Adjustable Hat: This sporty hat is made from a moisture-wicking fabric designed to keep you cool on hot days. It comes in white or red with the Nike logo on the front. It is available in one size fits most. This hat can be adjusted, making for a custom fit. In addition, the hat features interior tape to keep it in place and a black under-bill to reduce glare. This hat is priced around $25. Reversible Bucket Hat (pictured): This hat gives you two options in one. It comes in S/M or L/XL and in colors such as stone/navy, pink/white, tan/white and navy/dark khaki. It features a three-inch brim and an elastic draw cord for a custom fit. it is made from a quick drying fabric treated with titanium dioxide for ultraviolet protection factor (UPF) 50+ sun protection. This hat is priced around $30. Scala Raw-Edge Bucket Hat: This fun bucket hat comes in white, blue and black and in one-size-fits-most. 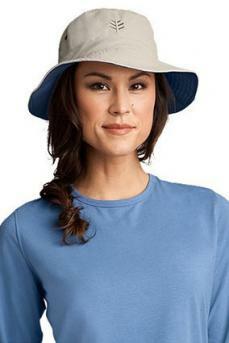 It features UPF 50+ sun protection and is fully lined and done in a blend of linen and cotton. It has a raw-edge brim and a beaded band on the crown. This hat is priced around $20. Not only are sun hats important as part of your overall sun protection plan, they also look terrific on women of all ages who enjoy wearing them too. What are you waiting for? Start looking for sun hats in your favorite stores or online before the best ones are all picked over.